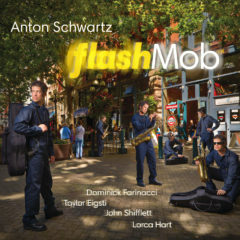 The most powerful aspect of Anton Schwartz’s new album, “Flash Mob,” is the manner in which it manages to evoke the greatest jazz quintets of the past while simultaneously stretching toward the future. When Schwartz and Dominick Farinacci (trumpet) play together in harmony on one of Schwartz’s strong heads (“Swamp Thang”) it recalls the great sax/trumpet combinations of the late 1950’s and early 1960’s — think Freddie Hubbard and Hank Mobley. But on tunes like Schwartz’s “Cumulonimbus” the group ventures right to the edge of free jazz. This balance would be tough to pull off without great supporting players like Taylor Eigsti on piano; John Shifflett, bass; and Lorca Hart, drums.